Richard Onyango’s bodies are unsettling. Art journalist Margaretta wa Gacheru mentions Onyango’s “disturbingly fleshy forms,” noting that she “was never a great fan of Drosie in Onyango’s art.” In a tiny mention, James Murua claims that Onyango’s “most memorable works” feature his “fat lover Drosie.” Frank Whalley describes Drosie as a “woman of mountainous proportions,” writing, more generally of Onyango’s work, “Our Hero has some difficulty with proportions, too. Unless painting women with bodies like elephant seals at the height of the rut, generally his heads are too small and the bodies too long.” A young blogger wrestles with Onyango’s mind-body negotiation. Of the (very little) commentary I have found on Onyango’s work, almost no one mentions his continual acts of self-portraiture. 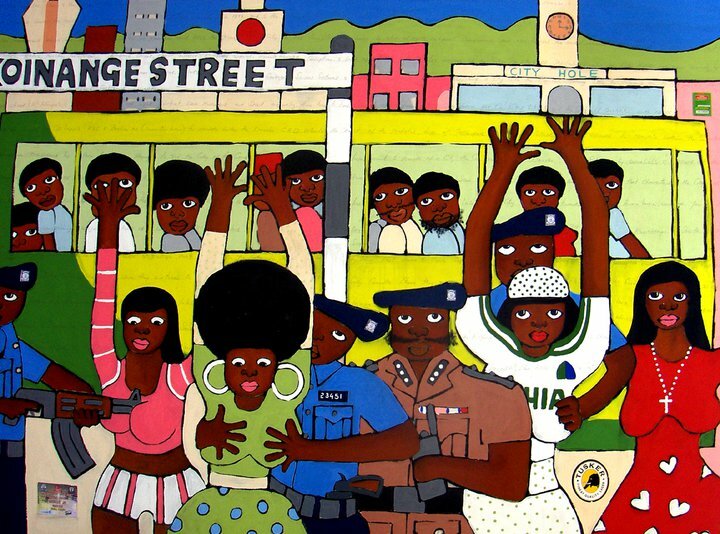 In fact, most of the so-called Drosie paintings depict Onyango with Drosie, and I find myself wondering about these critical acts of elision. What is it about Drosie that “disappears” Onyango? And what would it mean to read these two bodies together? What happens if, reading Whalley against the grain, we understand bodies in relation to Drosie? She is, Whalley suggests, the only one whose body is “proportional.” Everyone else is somehow excessive—the heads are “too small” and the bodies “too long.” Something interesting happens in these various readings of “excess,” something about how we imagine bodies to look and act. What might Onyango’s paintings make visible and imagine possible about bodies? I find myself looking for Onyango in his paintings, intrigued by the multiple acts of self-portraiture that struggle against a critical desire to make him disappear. Often, he is overwhelmed by Drosie: cast in the shadow of a foreground she dominates or smothered under her during an intimate encounter. His lean body compels us to think about masculine vulnerability. There are other ways to think about his lean-ness: the power differentials produced by class and race and geography—Drosie is a doctor and Kenyan Indian and wealthy, at least much wealthier than Onyango who, when they meet, is a part time musician. Drosie’s desirability is never in question, even as it is variously tender and seductive, rapacious and overwhelming. This desirability makes a claim on the observer, a nagging claim that is difficult to engage. The obsessive nakedness of Onyango’s desire unsettles us: it’s always difficult to translate our desires for others, even and especially when those desires are non-normative. Those desires make claims on other people, soliciting, eliciting, inciting a range of responses—I am struck, again, by Whalley’s and Gacheru’s discomfort, especially Whalley’s insistence that Onyango’s women cannot be desirable. Yet, I also find useful Whalley’s term “charming,” because it attempts to arrest what is disturbing about Onyango’s work. What might words like “incompetence” mask? What assumptions about art and artists are at stake—the academically trained vs. the self-taught; the cosmopolitan visionary who knows enough to break the rules vs. the one who doesn’t even know there are rules to break. One could multiply these. But I want to return to the experience of standing in front of Onyango’s Drosie paintings: to the sense of discomfort and shame that attends being invited (even compelled) to recognize and share in someone else’s desire—I have not yet mastered/mustered the cosmopolitanism that allows me to look at nudes and nakedness easily, and I think this lack is useful. I want to suspend, for a moment, the ways I know how to talk about male artists and female subjects, to pay attention to how Onyango’s insistent body forces me to another place I cannot yet name. I want to put to the side the bodies I have learned to see through Gauguin, Rubens, Freud, Currin, Bourgeois, Walker, Mapplethorpe, Mutu, Nugent, even Soi, and work through and around the discomfiting presence (and pressure) of Onyango’s bodies. Edit: On further reflection, what I find disturbing about assessments of Onyango’s work has to do with the relation between “seeing” and the “imagination”: seeing is an act of the imagination. And those who fault Onyango–I am not claiming he cannot be faulted–often seem unwilling to think through, with, and around his imagination. I am interested in asking what his imagination extends and enables, to think of the world-building he expresses as it travels within his viewers’ minds and bodies.